One of the hardest things about parenting, to me, is to not put my issues on my child. I hate trains, and I am not cool with mascots. But that's me. It's ironic, really, because I was a mascot in high school. But the fact remains, I am not cool with these fuzzy critters running around trying to "talk" to me without using their words. I was always the shy kid that got goosed or frightened by Mickey Mouse, Frankenstein, the ghost at The Haunted Mansion. Always. As an adult, I steer clear, muttering, "No, no, no," under my breath when there's one of these creatures around, stalking along, looking for victims. 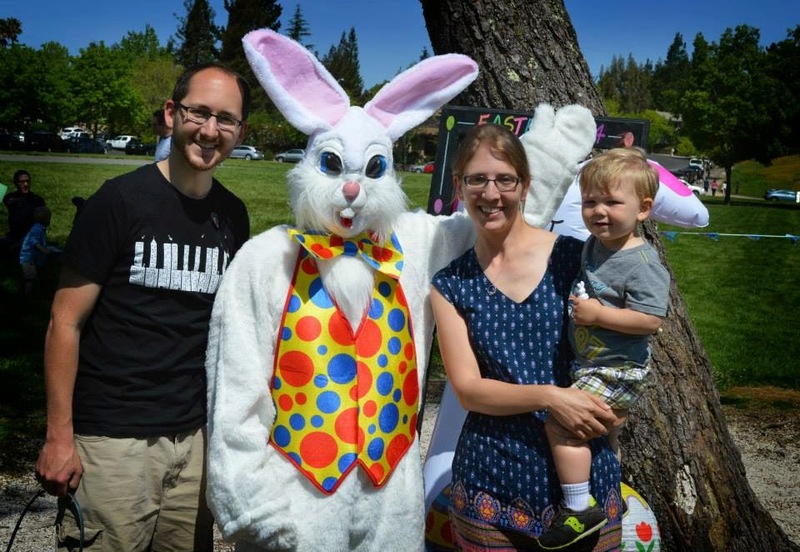 Now, I have a toddler, and holidays and amusement parks call out their sounding cry, complete with grown people professionally dressed up in furry costumes. We went to an Easter Egg Hunt. "The Easter Bunny is coming!" shouted the organizers. And in road the creepy man in a bunny suit on a Harley. Ari cries out, "Bunny! Bickle!" "Yes, baby, the bunny is on a bicycle" (sort of). "You want to go see the bunny?" I go get in line. "Really?" says my husband, knowing my thoughts on these disturbing beings. So, we waited in line. We got a family picture taken. Ari stared at the bunny with a HUGE grin on his face. "Bunny! Bunny!" When we were done, he kept repeating, "Bunny! Up!" "You want to go again and have the bunny hold you?" And so we waited in line again. The things I do for my kid...seriously. Once we got up to the bunny, Ari decided being held by the creepy crawly was not a good idea. And, of course, I was not going to force my toddler into the arms of the disturbing bunny. I'll not force my own ideas on my son (at least not all of them), but I'm also not going to push too hard the other direction, either. If he decides against being held by the living stuffed animal, I will fully support that decision.